Conducted Technical Orientation Session & Quiz on “Cloud Computing and Virtualization” in association with ATA Infotech Venture Pvt. Ltd on 18th and 19th January, 2018. Conducted “Python Week” along with Open-Source Club – BGI from 30th January 2018 to 3rd February 2018. Conducted a 5-Day Workshop on “Angular JS with PHP” in association with Netwizard (I) Entrepreneurship Development Council, A NPO Organization (Under the Ministry of Corporate Affairs) on February 13-17, 2018. Conducted Entrepreneurship Day, an open source club event on 21st February, 2018. Conducted Seminar on Industry Expectation from 21st Century Work Force in association with SMB iON, Tata Consultancy Services on March 6, 2017. Conducted Seminar on Mozilla and WebExtension API under the title “WebExtensions–MozActivate“ in association with Mozilla Regional and Global Community on 9th September, 2017. Conducted Seminar on Advanced Topic of PHP in association with iMerit Technology Services on September 15th, 2017. Conducted a talk on Overview of slack 101 along with Open-Source Club – BGI on 1st November, 2017. Conducted Big Data Hadoop Technical Workshop in association with ARDENT on February 9 – 10, 2016. Conducted Industrial Training on PHP Technology in association with WebGuru Infosystems Pvt. Ltd. on July 11 – 22, 2016. 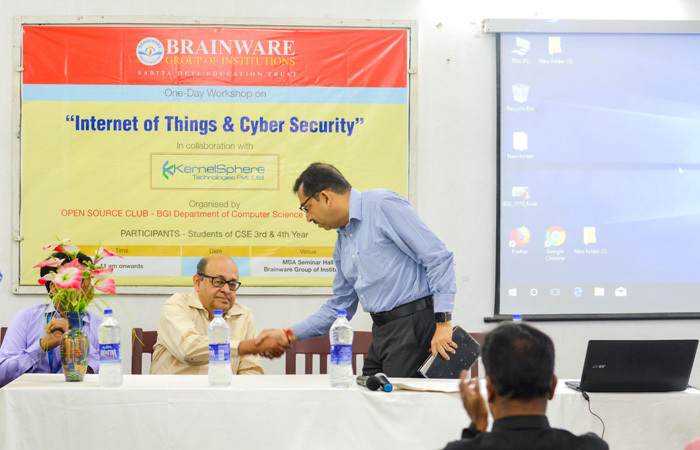 Conducted Seminar on .NET Technologies in association with Brainware University on August 19, 2016. Conducted Workshop on Android in association with Globsyn on August 30 – 31, 2016.